Love Hearts is an original crochet pattern by June Gilbank. This is a clever little pattern to make sweet hearts in three sizes – each heart builds on the pattern of the previous heart. 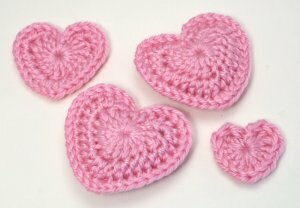 You can also make a bonus puffy heart to give a total of 4 different designs in this one pattern! String them into a garland, add a pin back to make a cute brooch, or fill a bowl with pretty hearts for Valentine’s Day decorating. Date Added: 09/04/2016 by Jackie M.
Date Added: 05/15/2012 by Monica B. Date Added: 02/13/2012 by Linda U. Date Added: 02/16/2011 by Amanda S.
Date Added: 01/31/2011 by Shelley P.
Date Added: 01/20/2011 by Monica B.